Age limit and required qualification to join Indian Army? Age limit required for girls to join Indian Army? How much percentage is required? Required age limit and qualification to join Indian Army? Is Diploma in Pharmacy good enough for joining Army? Can I join Army at the age of 21? How can a girl apply for officers rank in Indian Army with commerce stream without Maths? How much is the age limit required to join Indian Army? Age limit and qualification to join Indian Military? How can I join Indian Army being a 12th female candidate? Qualification required to join? Procedure and age limit to join Indian Army for Pharmacy Diploma holder? Eligibility criteria, age limit and suitable posts in Indian Army for CSE student? 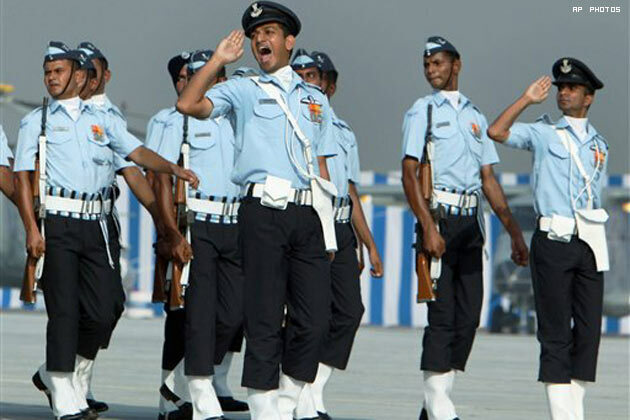 Procedure to join Indian Air Force for Diploma in Mechanical Engineering 2nd year student of 17 years old? Qualification required and age limit to apply? How to apply for Indian Army being a girl? Required Qualification for this? How can I join Indian Army? What is the educational qualification and the physical ability requirement? Possibilities of joining Army at 42 years age? How can a 26 year old candidate with 10+2 qualification, join Indian Army? How can I join Indian Army at the age of 26 years if I am having the NCC B Certificate and C Certificate? Re: Age limit and required qualification to join Indian Army? You did not have mentioned here, what is your current qualification. , the age limit for this examination is 16.5-19 years. for appear in this examination, you must have graduation degree from a recognized college. the age limit in this examination is for apply in IMA (Indian military academy) is 19-25 years. For both examination (NDA & CDSE), you must have Indian nationality, & having marital status UNMARRIED. To be part of the Indian Army, you can either apply after qualifying +2 level of exam or after completion of your bachelors degree program. If you have qualified +2 level of exam and you are within the age limit of 16 1/2 years- 19 years, you may apply for the NDA exam conducted by the union public service commission. If you are a graduate within the age limit of 19-24 years, you may apply for the combined defense service exam conducted by union public service commission. So, depending upon your qualification, you may appear for any of the examinations to join the Indian Army. According to education qualification,different defense service exam are conducted that are NDA exam and CDS exam. National Defense Academy (NDA) exam is conducted by upsc twice in a year to intake qualified Candidate for different department in Defense service like Indian Airforce, Indian Navy,Indian Army. Education qualification: Minimum candidate should complete 12th class with PCM stream. Age Limit: Age should be between 16 1/2 to 19 years. CDS stands for Combined Defense Service exam,this exam is held twice in year and exam is conducted by UPSC. For IMA /OTA : A degree from a recognized University or equivalent. i am sorry to say that you are not eligible for nda exam. -you should pass the 12th class. -your age should be 16.5-19 year. -YOUR AGE SHOULD BE IN BETWEEN 16.5-19 YEAR. If you have complete the 12th then you can join in Indian army through NDA exam. Candidate have to complete the 12th in any trade. The age should be in between 16.5-19 years. if you have done your graduation then you can join in Indian army through CDS exam.. Candidate must have complete the graduation in any trade. The age should be in between 19-24 years. So, you can go for any of these exam..
And for which you must have to Registered in employment office of you district. Sir,NDA exam is conducted by upsc twice in a year to intake qualified Candidate for different department in Defense service like Indian Airforce, Indian Navy,Indian Army. 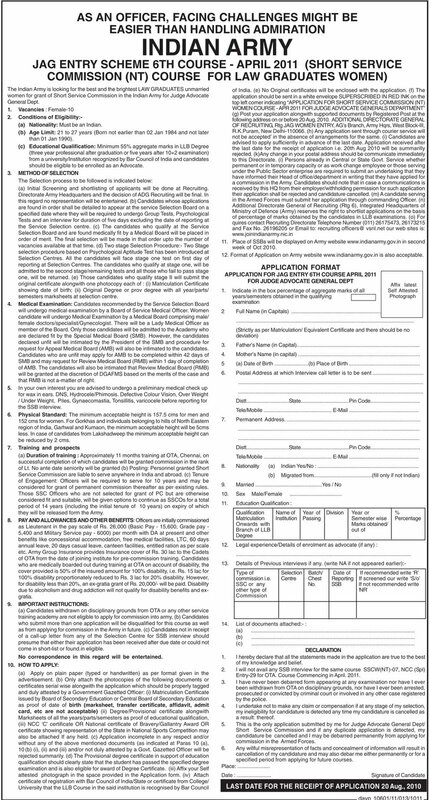 For Naval Academy: Unmarried male candidates between 19-22 years. HISTORY 5 SUBJECTS CAN I JOIN NDA ? Resp/sir sir i am a student of class 12th and i want to join indian army.so' what should i do, my age is 16-5. If you want to join indian army then NDA is best platform for it.. This exam is being carried out by UPSC(Union Public Service Commission).This exam is being held every year twice namely as NDA I and NDA II. The candidates who need to wants to apply for the NDA Exam must have satisfied the eligibility criteria framed by the NDA Exam. Eligibility for NDA: Candidate applying for the NDA Exam must be a unmarried male candidate and the candidate must have a citizenship in India. The age limit for the exam specifies that the candidate must have a age between 16 1/2-19 years. The education qualification stats that the candidate must have completed +2 from a recognized board of school education with a fair percentage with physics and mathematics as subjects for joining in Air Force. The candidate appearing for the NDA exam must be a physically fit while appearing for the NDA exam. hi sir. I am student BA part -2. i am 10 2 compilite.am i join army? NDA [NATIONAL DEFENCE ACADEMY], exam is conducted by the union public service commission every year. For appear in this examination, you must possess 12th Class pass of the 10+2 pattern of School Education or equivalent examination conducted by a State Education Board or a University. The candidates must be a unmarried male candidate. The candidates must have a age limit of 16 1/2-19 years. There is not any kind of age relaxations are applicable for any reserved category. Usha subba my age is 24 year old i have to give cds exam an i am karate trainer. For more details you can visit website of Indian army & upsc . If you want to join the Indian Army, then you have to sit for the NDA exam. NDA stands for the National Defense Academy. Its is an All India Entrance exam which is conducted by the UPSC (Union Public Service Commission) every year to recruit candidates for the various wings of the Army, Navy and Air Force. 1. You should be an Unmarried Male Indian National. 2. You should have passed class 12th from a recognized school or state board of India. 3. Maths and Physics are compulsory subjects if you want to apply for the Indian Navy or Air Force. 4. Your age should be within 16.5 to 19 years. 5. You should be physically fit and no PD candidates would be allowed in this exam. So if you satisfy the above conditions, then you may apply for the NDA 2012. The Notification 2012 has been released very recently on 31st December 2011. The deadline to apply for NDA is 30th January 2012. Please do the needful before this date. The exam will be held in various states in India on 15th April 2012 (Sunday). With this post, I am attaching the Notification and the structure and pattern of the exam. Please download and go through them in order to prepare well. Click Here to visit the online UPSC website. sir i am collage student in open university and complit my grajvation .but i am not s.s.c. and h.s.c.but i am interested army dipartment.so what i do.pls rply. respected sir i need to know about the physical fitness for joining in indian army,navy,airforce? If you want join in Indian Army through NDA, CDA and UES.These Exams are conducted by UPSC (Union Public Service Commission). To apply this examinations the candidate must have to complete 12th or graduation from a recognized university. Education Qualification: 12th pass from a recognized university. Age Limit: - 16.5 to 19 years. Education Qualification: Completion of Graduation from a recognized university. Age Limit: - 19 to 24 years. Age Limit: - 18 to 28 years. And more information about these examinations please visits the website www.upsc.in. 1. NDA:- NDA can be expanded as National Defense Academy exam conducted by UPSC. This exam is conducted twice a year. And this exam acts as an entrance exam for choosing people for joining in Indian Defense Services. To appear in this exam and join in Army through this your age must be above 16.5years and below 19years. You must have completed your 12th std from a recognized board. 2. CDS:- CDS can be expanded as Combined Defense Service exam conducted by UPSC. This exam is conducted twice a year. And this exam acts as an entrance exam for choosing people for joining in Indian Defense Services. To appear in this exam and join in Army through this your age must be above 19years and below 23years. You must have completed your graduation from a recognized university. There are also some other mode of entries like University Entry Scheme, NCC entry etc. Thus you can join in Army through any mode but your age must be below 25years. Both Exam is conducted by U.P.S.C twice in a year.. Candidate who pass the graduation in stream is eligible for C.D.S exam. Age of the candidate should be in between 19-24 year. > Pass 12th with any stream from recognized board. > Age limit should be above 16.5year and below 19 year. i) ARMY: A pass in class 12 or its equivalent is enough. ii) NAVY and AIRFORCE: A pass in class 12 with compulsory math and physics as subjects. 2.You must be aged between 16 1/2 and 19. 3.You must be an unmarried male. 4.Till the end of course you should not get married. 5.You must be free from all illnesses. dear sir i have complete my 12 class in non medical 48% marks & i have an knowledge about army life because i have done in all activities to do in army life my self sumeet dogra i havejoin in NCC my rank is SUO i have done B certificate in ncc infentry. , india trecking camp held at dehradun in 2006 , i have complete army attachment camp organise by 6madras basantar battlian jammu. many other certificates i have done like ATC, CATC, ETC. NOW SIR I REQUEST U to so i have to do join army . what will i do sir please reply i am thankfully to u. my age is an 22 . -One can apply for NDA exam via online mode Only. Written test date : 15/04/2012. Please give the detail of education , which is req for these requirement for indian army or any armed forces. my date of birth is 23.09.1987.
my education detail 10th , 10 2 , polytechnic diploma in I.T ,PG diploma in store management. to go for Indian army the candidate have to apply for the Combined defense service exam which is conducted by the U.P.S.C. candidate should be a graduate or a final year appearing from a recognized university. in nutshell all above test are taken to test the intelligence and the social traits of a candidate. Indian Army can be joined basically in two ways one after 12th standard through NDA exam and other through CDS exam after Graduation. NDA - NATIONAL DEFENCE ACADEMY exam conducted by UPSC twice every year for entry in to Indian Army, Navy and Air Force wing of NDA. -Should have possessed good Physical and Mental health. CDS - COMBINED DEFENCE SERVICE conducted by UPSC twice every year for entry in to Indian Military Academy, Naval Academy, Air Force Academy and Officer's Training Academy of CDS. -Should have possessed good Physical Fitness. The selection for both NDA and CDS are through written exam followed by personal interview along with Physical Fitness and Medical Test. what is the age limit and qualifications needed for joining indian army? ?